Because of the widespread influence of Calvinism, this is perhaps one of the most important studies a Christian can ever en age in. 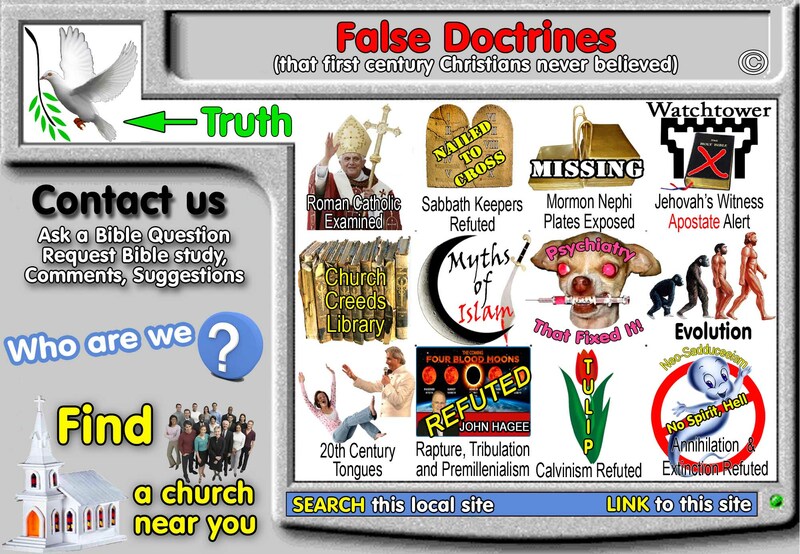 It is essential to become familiar with these false doctrines so that one will not be led astray. To that noble end, this effort is dedicated. History of the Christian Church Vol II P 246 Philip Schaff, "It was the universal faith of the church that man was made in the image of God, pure and holy, and fell by his won guilt. But the extent of sin and the consequences of the fall were not fully discussed before the Pelagius-Augustine controversy in the fifth century." John Calvin was born in France on July 10, 1509. As a result of his study of the Greek New Testament, Calvin became dissatisfied with and left the Catholic church. Through his influence and teaching, he became the founder of the doctrinal system known as Calvinism. Calvin did not technically establish a denomination during his lifetime. However, his theology is the basis for the modern day Presbyterian church. It is somewhat difficult to find a classic five point Calvinist these days. However, almost every religious denomination has adopted a Calvinistic­like theology. Even some of the cults have accepted some Calvinistic principles. The Jehovah's Witnesses, for example, believe in the concept of inherited sin. ISBE, 1979, Depraved. "In the history of theology mankind's depravity has been interpreted as coming from Adam. Augustine, (354-430AD) credited with formulating the concept of original sin, held that Adam's fall corrupted man, making the human race a mass of sin. Man inherited both the tendency to sin and the guilt for Adam's sin for in him the entire race sinned. Britannica 1979 VII, Pg837-8, "Pelagianism...(Palagius 370-440AD) rejecting the arguments of those who claimed that they sinned because of human weakness, he insisted that God made human beings free to choose between good and evil and that sin is voluntary. Celestius, a disciple of Pelagius, denied the church's doctrine of original sin and the necessity of infant Baptism" "He (Pelagius) blamed Rome's moral laxity on the doctrine of divine grace (as taught by Augustine) He attacked this teaching on the grounds that it imperilled the entire moral law. He thus reasoned that if a man were not himself responsible for his good and evil deeds, there was nothing to restrain him from indulgence in sin. Pelagus soon gained a considerable following at Rome"
Calvinism: "A comprehensive theological system chiefly distinguished by its view of God and His relationship to man. The name of the system is derived from John Calvin's surname..." The five points of Calvinism P1. Calvin accurately taught the correct concept of man before the fall: "Man, in his state of innocency, had freedom and power to will and to do that which is good and well-pleasing to God; but yet mutably, so that he might fall from it." "God has endued that will of man with that natural liberty and power of acting upon choice, that it is neither forced for, by any necessity of nature, determined to do good or evil." (Westminster Confession of Faith) This freewill nature of man did not change when Adam and Eve sinned but is the same today.